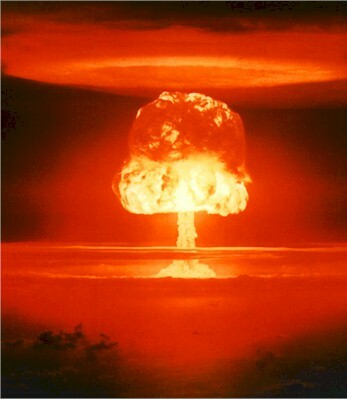 "Atomic bomb of contemporary music" was Virgil Thomson's phrase for Olivier Messiaen in September 1945, when the French master was first becoming known in America. It's fitting that the St. Louis Symphony will proceed from Messiaen's Turangalîla Symphony to John Adams's Doctor Atomic Symphony in its concerts this weekend at Carnegie Hall. The Messiaen, on Friday night, will be accompanied by a multimedia demonstration by David Robertson, St. Louis's music director, who has proved very deft at such events in the past. The price is nice: $10-$35. On Saturday night, Adams's symphony, derived from the score of Doctor Atomic, nestles grimly with Brahms's Tragic Overture, Sibelius's Tapiola, and Berg's Violin Concerto (with Christian Tetzlaff). The same night, the venerable new-music ensemble Continuum presents an evening of works by the late, colossally original, unrelentingly austere Russian composer Galina Ustvolskaya. The following afternoon James Levine picks up the doomy thread with an intense-looking MET Orchestra program. Alfred Brendel is making his final appearances at Carnegie in the coming week — his formal farewell is on Wednesday, when he plays Schubert's great B-flat-major Sonata — and it would appear that Levine is marking the occasion by surrounding Brendel's performance (Mozart Concerto No. 24) with a kind of raging pyre of Austro-German musical mayhem: Berg's Three Pieces for Orchestra, Webern's apocalyptic Six Pieces, and the final scene of Salome (with Deborah Voigt kissing the head). For musicmaking in a very different tone, go to Bargemusic this weekend for a program of autumnal Strauss (the Sextet from Capriccio), Brahms (String Sextet No. 2), and the New Yorker's Russell Platt (the world premiere of his Sextet with Voice, Transport to Summer). Read more here.